designer's note: Since I'm in the US, I based this on the US Flag, however it could easily be adapted to other countries' flags -- remove the blue and stars and use red for Canada, just remove the stars for Great Britain, swap the blue and red for Australia, use red/green/white for Mexico or Italy. You get the picture. 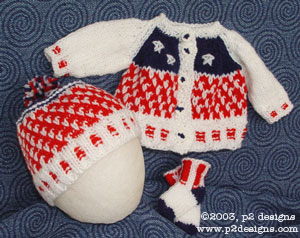 These patterns are for charity or personal use only -- neither the patterns, nor items made from them, are to be sold!